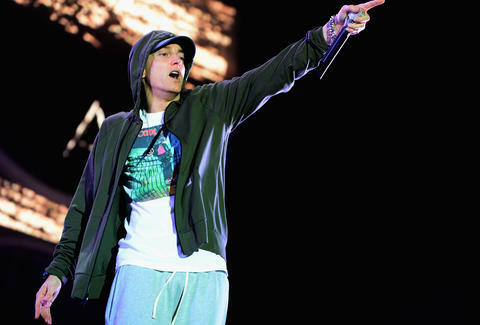 Eminem isn't known for self-deprecating humor, but the pioneering MC at least acknowledges one joke pertaining to his hit song "Lose Yourself" has stood the test of time. To celebrate the Friday release of his new album Revival, the rapper is serving his stalwart fans "Mom's Spaghetti" in his native Detroit. “His palms are sweaty, knees weak, arms are heavy / There’s vomit on his sweater already, mom’s spaghetti. But Em is doubling down on the the pasta-inspired joke this weekend at the Detroit hip-hop institution The Shelter, selling merch and spaghetti-inspired eats on Friday and Saturday between 10 a.m. and 5 p.m. If you're nowhere near Detroit, but still want to lose yourself in the moment and never it let it go, feel free to listen to the original "Lose Yourself." You can also check out the alternative version of the song which focuses primarily on Eminem saying the word spaghetti over and over. After all, this opportunity may only come once in a lifetime. Or something.